The process of adding students to courses is called Enrollment. This is different from adding users to the site, which is known as Authentication. Let’s first start with the authentication methods. By default ScholarLMS provides two mostly used authentication methods. Email-based self-registration: The email-based self-registration authentication method enables users to create their own accounts via the ‘Create new account’ button on the login page. They then receive an email at the address they specified in their account profile to confirm their account. There is a chance your institute/company may not want learners to self register themselves in which case you can disable email-based self-registration authentication method. 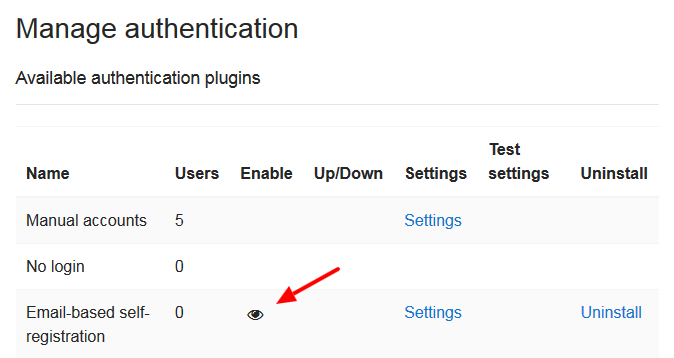 To do that, go to Settings->Advanced settings->Plugins->Authentication->Manage authentication and click on the eye ball icon. See the supporting screenshots below. Once you have covered how your learners should get into the system, we can next move on to setup how they should be enrolled in a course. The methods we choose here will be site-wide available. Further in a course you can locally enable/disable these methods or change their settings. There are five enrollment methods which comes default to your LMS. Manual enrollment: The manual enrollments method allows users to be enrolled manually via a link in the course administration settings. This method necessary for several actions and must be always enabled. Self enrollment: Self enrollment is the method whereby users can choose to enroll themselves into a course, either immediately by clicking “enroll me in this course” or by typing in an enrollment key they have been given. The enrollment plugin needs to be enabled by the site admin and has to be enabled within the course. The manual enrollment plugin has to be enabled in the same course as well. Cohort sync (optional): Cohort sync is for automatically enrolling members of a cohort in a course. If a user is added or removed from the cohort, they are automatically enrolled or un-enrolled respectively. In other words, cohort sync synchronizes cohort membership with course enrollment. Paypal (optional): The PayPal enrollment method allows users to pay for courses and then be automatically enrolled. 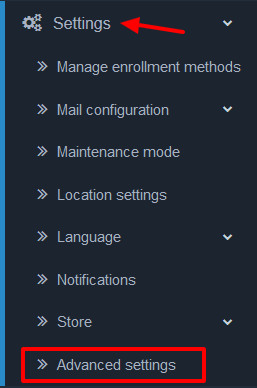 To access Enrollment methods of your site, go to Settings->Manage Enrollment Methods on the left side navigation. While navigating to the enrollment method page you shouldn’t disable three Enrollment methods as they are vital for running your site smoothly (see the screenshot below) but you can change their settings as per your requirements.